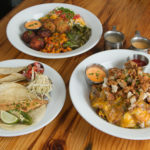 Geer Street Garden serves simple, down home food and drinks in a relaxed atmosphere. The basic idea is that everyday food should be wholesome and delicious. We have a large outdoor patio that’s a perfect place to meet your friends and neighbors for a pint of beer and a local pasture raised burger.